The given operation should be carried out with use of a gas bag and exact weight дозатора. The additional charge of a coolant is added in the external block if necessary, or at length of an interblock line over 5 metres, with the account of 15−20 gramme on each additional running metre of a line, — by means of soaking up the valve through service port. •Remove a cap of service port. 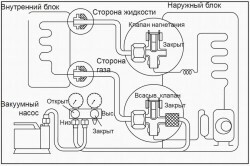 •Connect the party of low pressure of the refuelling gauge to the centre of service port всасывания a cylindrical tank and close the party of a high pressure of the gauge. Blow air from a service hose. •Open a gas bag and the refuelling valve of low pressure. — when demanded quantity of a coolant закачано in the unit, close the party of low pressure and the gas bag valve. •Disconnect a service hose from service port. Return into place a cap of service port. Coolant R410A, — non-polluting freon, and, does not cause harm to an ozone layer. Working pressure of this coolant R410A, — in 1.6 times above, than at coolant R22, therefore it is necessary correct, careful installation and service of the unit working on this coolant is more white. Never apply other type of a coolant, except R410A in the conditioner intended for work on this coolant. The River of Island Е oil is used as greasing for the compressor working on coolant R410A, this oil differs from the mineral oil used for the compressor, working on coolant R22. In an installation time or service special safety measures not to subject the system working on coolant R410A are necessary, for too long influence of damp air. The River of Island Е oil in the pipeline and other components can absorb a moisture from air. Blow of the pipeline and the internal block. Installation of split-systems. The circuit design and an order of pumping out of a refrigerating contour of the air conditioner. The outdoor block of the air conditioner has a preliminary filling a coolant approximately on 5-7 metres of an interblock route (a factory filling хлад. The agent). Pumping out of split-systems by the vacuum pump. The internal block and the coolant pipeline should be продуты air as air containing a moisture which remains in a coolant contour, can call derangement of the compressor. Remove caps from the valve and service port. Connect the centre of the priming sensing transducer to the vacuum pump. Connect the priming sensing transducer to service port of the 3h-running valve. Start the vacuum pump. Carry out pumping out of split-system within 30 minutes. The pumping out time фреоновой highways can change as a function of productivity of the vacuum pump. If the needle of the sensing transducer of a manometrical post, a manometre did not move forward to-760 mm hg, muster presence of leak of gas (by means of the coolant leak detector) on the cone joint of internal and outdoor blocks of split-system, eliminate leak before realisation of a following step. Close the valve of the priming sensing transducer and shut down the vacuum pump. - on the outdoor block open the snifting valve (3h-running) and fluid-flow valve (2h-running) (turn counter-clockwise) with the help 4мм a key for the hexagon screw. Important: After pumping out at split-system start-up (is more detailed: trial start) muster токовые characteristics and manometrical parametres. Muster conformity voltage in a network. If necessary add, dress freon the air conditioner on токовым to pincers — (minus) of 10 % from face value. At excess of gas, a short interblock route of 1-1,5 m., or at an undervoltage, — lower колличество gas on токовым to pincers a minus of 10 % from face value. So it is important, at current indication that the air conditioner thus would work with a total load in regimes cooling or heating. How to dress the air conditioner. The given operation, air conditioner filling, should be carried out with use of a gas bag and an exact weighing batcher. The additional charge of a coolant is added in the outdoor block if necessary, or at length of an interblock route over 5 metres, with the account of 15-20 gramme on each additional running metre of a route, — by means of the suction valve through service port. Detach a service hose from service port. Return into place a cap of service port. If you performed all procedural works on an air conditioner filling in exact conformity, that, you have a confidence that your split-system is dressed correctly. Coolant R410A, — non-polluting freon, and, does not cause harm to an ozone layer. Working pressure of this coolant R410A, — in 1.6 times above, than at coolant R22, therefore it is necessary correct, careful installation and service of the assembly working on this coolant is more white. Never, at a split-system filling, do not apply other type of a coolant, except R410A in the air conditioner intended for work on this coolant. The River of Island Е oil is used in the capacity of greasings for the compressor working on coolant R410A, this oil differs from the petroleum oil used for the compressor, working on coolant R22. In an installation time or maintenances special precautions not to subject the system working on coolant R410A are necessary, for too long affecting of a moist air. The River of Island Е oil in the pipeline and other components can absorb a moisture from air. For prevention of wrong calculation of a charge of a coolant diameter of service priming port of the cone valve differs from diameter intended for coolant R22. Use tools and the materials intended only for work with coolant R410A (the collecting channel valve, a filling trunk, the pressure unit, the coolant leak detector, tools for rolling, a dynamometer key, the vacuum pump, a ballon tyre for a coolant). As the air conditioner working on coolant R410A, has higher pressure, than the assembly working on coolant R22 it is necessary to choose correctly copper tubes on a thickness and strength. Never use copper tubes 0.7 mm are more thin. At leak of a coolant during installation / service works it is necessary to aerate a premise well. In case of contact of a gaseous coolant to fire was possiblly origination of toxic steam. At installation or air conditioner dismantle it is not necessary to leave air or a moisture in a refrigerating contour. The additional information: the Grant on work with air conditioners and split-systems on 410 freon.